It's a Madrid Derby again! Will Atletico Madrid make history by becoming the first team to overturn a three-goal deficit in a semi-final? Or will Real Madrid stay on course for back-to-back Champions League title? 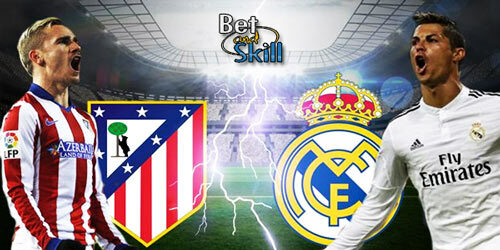 This article contains our Atletico Madrid v Real Madrid betting preview with predictions, betting tips, starting lineups, team news, enhanced odds, bookie promotions and no deposit free bets on this clash. Atletico Madrid were compeltely outclassed by their city rivals last week. The Rojiblancos did follow this disappointment with a 1-0 win over Eibar to consolidate 2nd position in La Liga, but they are ten points adrift of Real Madrid in the table. Simeone's men have managed five wins from their last six games at home, keeping a clean sheet in four of them and they have not lost a Champions League game at the Calderon since September 2015. Diego Simeone is likely to recall either Kévin Gameiro or Fernando Torres, in order to partner Antoine Griezmann upfront. With Juanfran, Sime Vrsaljko and Jose Gimenez on the sidelines, Lucas Hernandez may have to play at right-back like he did in the first leg. In midfield, Gabi and Saul Niguez will play in the middle of the park with Yannick Carrasco and Koke on the flanks. Real Madrid lead 3-0 from the first leg in this semi-final tie, courtesy of a Cristiano Ronaldo's hat-trick. The Blancos have not lost win the Champions League this season, winning eight and drawing three. Domestically, they kept their La Liga title hopes alive at the weekend, thumping Granada 4-0 - despite Zidane gave rest to his star men - to record seven wins from their last eight outings. Real also ran out 3-0 winners when they visited Atletico Madrid in La Liga earlier this season. Gareth Bale is not expected to recover from a calf injury in time to feature in the 2nd leg and Isco is the most likely to deputise in his absence. Karim Benzema and Cristiano Ronaldo look sure to retain their starting berth. Marco Asensio and Alvaro Morata provide further options upfront. In defense, Pepe is also out with broken ribs but Raphael Varane could be in line to return to the lineup. "Atletico Madrid v Real Madrid predictions, betting tips, lineups and free bets (Champions League semifinal 2nd leg - 10.5.2017)"